Though the events were nowhere near as dramatic as those at the Men’s Gymnastics yesterday, the display that the US Team put on today is worthy of my Golden Moment. 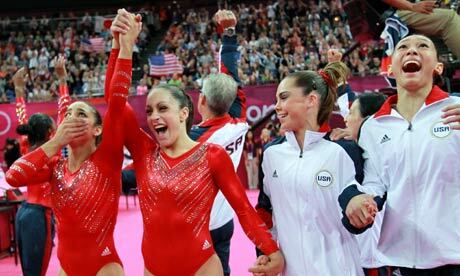 They excelled in every apparatus, the way they landed each vault putting just about every other country to shame. They made me enjoy the floor work too, which is a big deal considering how much I hate the fact they ‘dance’ and do it out of time to inappropriate music. These girls proved that you could make the floor work look both impressive and beautiful and they fully deserved their Gold medal. It was also great seeing the GB Team do well, Beth Tweddle on the Uneven Bars especially showing the high quality Gymnasts we are producing. Going into tonight’s Swimming events, most eyes were on Michael Phelps who was set to break the all time record for medals won if he could secure one in both of his events. As reigning champion the 200m Butterfly was his to lose, and lose he did. Chad Le Clos of South Africa had been swimming strong for the first 150m keeping close enough to Phelps to secure Silver but we thought nothing more. Those last 50m however he pushed himself to the limit and beat Phelps by the smallest of margins. We couldn’t believe it, Phelps couldn’t believe it and Chad was amazed he had pulled it off. His post race interview was an emotional one, as he talked about how Phelps had always been his hero and simply racing in the final with him was the ultimate dream. Beating his ultimate hero had never crossed his mind, and the emotions continued as he took the podium to receive his medal. Even his Dad got in on the interview action, his elation talking about his son to Claire Balding being the best moment of all of the BBC coverage so far. It was a brilliant Olympic moment, overshadowing the eventual record Phelps broke later in the night which is why Chad Le Clos is my Athlete of the day. I’m going to make a strong prediction that tomorrow will feature the first Gold Medal for Team GB, from either Bradley Wiggins in the Cycling Time Trial or Michael Jamieson in the 200m Breaststroke. The second of those is especially promising given that he qualified top of the leaderboard breaking another Britsih record in the process. The first medals in the Rowi ng will be coming too, which is always full of drama for our team. Tags: Gymnastics, Swimming. Bookmark the permalink.